Over here in the United Kingdom a trio of Android smartphones will be coming out to play next month on the O2 UK network, with both the HTC Sensation XE and HTC Rhyme handsets coming soon while the availability of the Samsung Galaxy Y remains to be confirmed. According to the guys over at Unwired View, O2 has now put up all three of those Android handsets to their coming soon page and all are Android 2.3 Gingerbread devices. The HTC Sensation XE is of course the upgraded model of the original HTC Sensation and comes with Beats Audio, bigger battery and a 1.5GHz dual core processor, with all other specs remaining the same as the original so you get a 8 megpaixel auto-focus camera with dualLED flash, 1080p video recording, VGA front facing camera, 4.3-inch qHD touch screen 1GB internal memory, and either an 8GB or 16GB microSD card pre-installed. The HTC Rhyme is of course formerly known as the HTC Bliss, the female orientated handset that offers 3.7-inch touchscreen display, 5-megapixel autofocus camera with LED flash, HTC Sense 3.5, 1GHZ single-core processor, 3G, Wi-Fi, Bluetooth, along with a shopping and calorie counting app along with a “charm indicator” accessory for the girls. As for the Samsung Galaxy Y, you get a 3-inch QVGA touch screen, 2 megapixel camera, 832Mhz processor, WiFi, Bluetooth 3.0, and sports a 1200mAh battery and of course access to the Android Market. 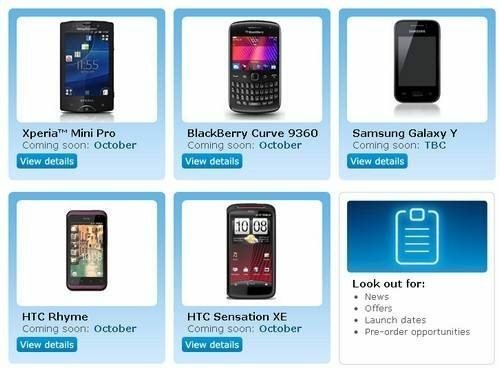 No hard and fast release day for any of the above devices on O2, although as an entry level handset the Galaxy Y should be the cheapest while the HTC Sensation XE will no doubt be the most expensive, more on release day and pricing as and when we hear.